"When I first started I thought this can’t possibly be helpful at all! (Laughs.) It felt too easy and I didn’t sweat. 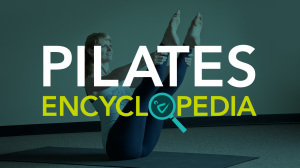 It took me a long time to get it and understand why Pilates is different from all other workouts." "I initially started Pilates purely because it was convenient for me. My office was located in the same building as the studio. But what made me stay with Pilates, was that I noticed changes in my body that I had never seen before regardless of whatever other workouts I had done. For the first time ever I noticed improved posture, better muscle consciousness, and body awareness and my stomach muscles were actually getting tighter. I felt myself getting stronger. I like the strength building aspect of Pilates. Because Pilates is so process oriented and posture is so important you can’t cheat during your exercises, so you really build strength. When I lifted weights in the past I used a lot of momentum. I felt that my strongest muscle would dominate all other muscles, so I was not getting to the weaker ones. It takes concentration to make the weak muscles work. With Pilates, all my muscles work together with great concentration! My biggest advice to anyone starting Pilates is to give it time. When I first started I thought this can’t possibly be helpful at all! (Laughs.) It felt too easy and I didn’t sweat. It took me a long time to get it and understand why Pilates is different from all other workouts. Although, I did notice results earlier. Now I always sweat at the end of my workout. If you stick with it, then you’ll definitely see results. Now, when I see people doing sit-ups, I can tell when they are doing them right. Most people are basically flying through them, using momentum instead of muscle strength. They’re literally doing nothing. Particularly when you don’t have many muscles, it’s really hard to do a sit-up correctly. Then you just throw yourself up there, and you sweat but you’re not developing any strength. You do a lot, but you don’t achieve anything. You put in a lot of effort for very little result, and then you get frustrated. You can’t do that in Pilates. That’s what makes it so great.